Before installation check visually and turn the drive dog or gear to ensure the distributor has not been damaged in transit. To ensure the life of any electronic ignition module it is advisable to have silicon or resistive HT leads, if you currently have copper these are not advised. 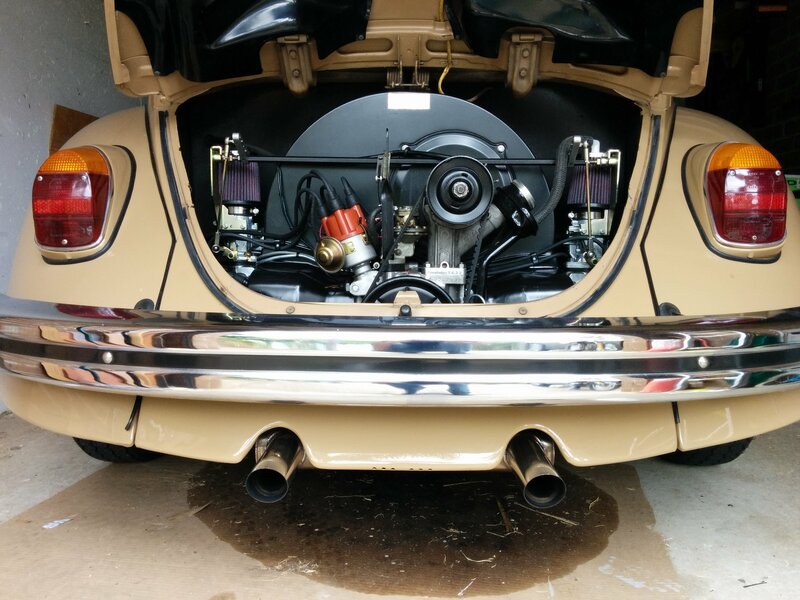 Before removing the old distributor from the engine turn the engine to TDC No1 position and confirm the position of the rotor arm ( should align with No1 lead ). Fit the new distributor and connect leads etc confirm the rotor arm aligns with the No1 lead, leave the distributor clamp loose enough to turn the distributor once the engine has started and complete setting the timing dynamically and tighten the clamp. B) New Powerspark Distributor purchased with Powerspark electronic module installed. 1. Check the coil resistance to ensure that your coil has a resistance of more than 1.5 ohms for our standard electronic distributor (less than 1.5 ohms for our sports/performance module) and remove any ballast resistor present in your vehicle for this measurement. The ignition coil range on a standard system or ignition kit is between 1.5 and 3.4 Ohms, failure to adhere to this can result in an erratic spark and premature failure of the electronic products. If you are unsure about the coil that is fitted to your vehicle the coil should have a minimum primary resistance to that recommended here depending on the you have installed module. The Powerspark red module red wire connects to positive ( + or 15 on Bosch coil). The black wire connects to negative ( –ve or 1 on Bosch coil). To measure primary resistance: Label and remove all wires to coil. Using a digital multi-meter in the 200 Ω mode, measure between coil’s + and – terminals. Allow a few seconds for the reading to settle. The primary coil resistance should be no more than 3.4 Ohms. To measure the secondary resistance place the multimeter through the central coil terminal and to one of the coil terminals. For best performance, the coil should have a minimum of 7,000 Ohms secondary resistance (measured from the coil +ve or –ve terminal to center high tension terminal, in the 20K Ω mode of the Ohmmeter). To ensure the life of the kit it is advisable to have silicon or resistive HT leads (if you currently have copper). You can set the timing dynamically with a strobe light with points ( engine running ) and with electronic system you can do the same. You can set the static timing approx as before and you will need a strobe light ie + and –ve to strobe and sensor lead to No1 plug lead to set the timing dynamic and then adjust to max @ 3500 rpm say 24 degree (depends on the vehicle and engine). 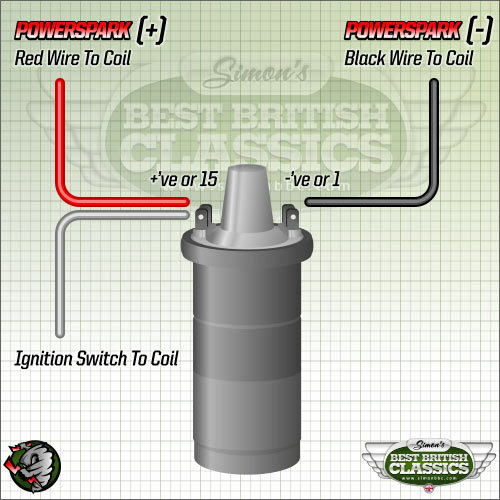 The Powerspark electronic ignition module is mounted as near as possible to the same position as the points were, but in some cases the distributor will possibly have to be turned +/- 10 degrees from where it was with points. Setting the timing is recommended once you have fitted one of our electronic kits. Setting by dynamic is the best and most accurate way to adjust the timing. Powerspark recommend using caution when jump-starting the vehicle fitted with our electronic kit. Connect the battery’s + terminal to the other vehicle’s battery + terminal. Connect the negative (black) part of the jumper cable to engine ground points, such as a bolt on the engine block, on both vehicles. Do not turn the ignition switch to the ON position while the vehicle at the other end of the jumper cables is running. Charge your vehicle battery with the other vehicle or with a battery charger and then remove the jumper cables or charger before turning on the ignition switch and starting your vehicle. If the ignition switch is in the ON position while both vehicles are running, the electrical surge resulting from both vehicles’ charging systems being connected together with jumper cables could be enough to destroy the ignition module and/or other any electronic components. Use of this help page by anyone unauthorised to do so will be in breach of copyright.